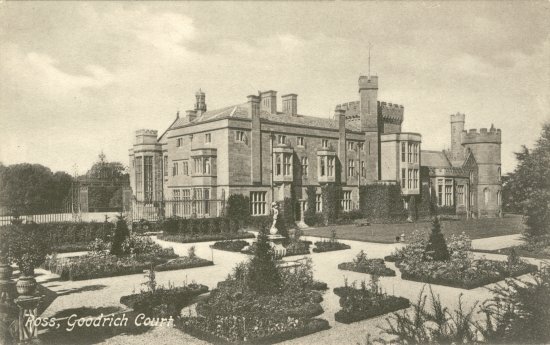 The present walled garden of the now vanished Goodrich Court was built in 1889, some 60 years after the Court itself, which was on the other (eastern) side of the Ross-Goodrich road. At 2.8 acres it is huge by any standards, and in its heyday 9 men were employed in its cultivation. After many years of neglect the garden is slowly being brought back into productive use. The plan is to use one acre for growing cut flowers for sale, one acre for kitchen gardens and the remainder will be lawns, herbaceous borders and topiary. The cut flowers, grown by Angie Fuller, already occupy half an acre and about a quarter of the kitchen garden area is under cultivation. The latter is grown on strict organic principles by Robert Milne, a professional gardener whose mission is to promulgate the virtues of organic and self-sufficient kitchen gardening, and who is laying out demonstration gardens to this end. A number of open days, with talks and guided tours were held during the summer and Mr. Milne has run weekend courses on organic vegetable growing. It is hoped that greater public access will be possible in future. News of the revival of the walled garden affords a good opportunity to recount some of the history of the extraordinary building that was Goodrich Court, and its equally extraordinary builder, Sir Samuel Rush Meyrick. Two good modern sources are available for this. In the book The Romantic Interior' by the late Clive Wainwright a chapter is devoted to Meyrick and his collections, while the architectural history of the building is fully detailed in the Woolhope Club Transactions of 1977 by Hugh Meller. Meyrick, born in 1783, inherited from his wealthy father a passion for arms and armour and in due course, via his brother, inherited the collection his father had acquired, which he added to for the rest of his life. He became Europe's leading scholar in this field and wrote a three volume study, which, according to Wainwright, is still a standard work today. He reorganised the displays of Horse Armoury at the Tower of London and the armour at Windsor Castle and was knighted for these services in 1832. In a contemporary novel he was satirised in the character of 'Old Sir Chainmail'. His collection was housed in his home in Chelsea, but influenced by his friend, the romantic novelist Sir Walter Scott, he determined to acquire a castle to show it off to advantage and turned to the Welsh Borders, probably because he claimed descent from a leading Welsh family. For a long time he negotaiated to buy what was left of Goodrich Castle, but when this failed he decided in 1828 to build his own castle on the adjacent hill. For his architect he chose Edward Blore, a fellow antiquary with a successful country house practice. Blore normally specialised in rather unexciting Elizabethan style houses. The eminent architectural historian Sir Howard Colvin says of him "A dull competence pervades all his work". However on this occasion, inspired by Meyrick, he designed a flamboyant essay in a castellated, romantic style. The building bristled with battlements, towers (one a hundred feet high), gables and pinnacles. There was a dry moat with a drawbridge and portcullis. 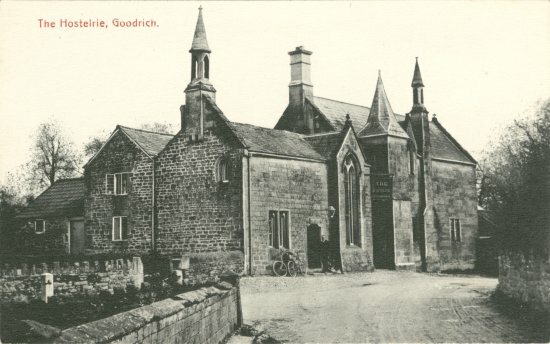 The nearest local equivalent would be Eastnor Castle, built a few years earlier, but whereas that building, for all its castle appearance, is symmetrical in plan, Goodrich Court was more asymmetrical and picturesque. It was supposed to be in the style of Edward II's time, but seems to have a more continental look to it. 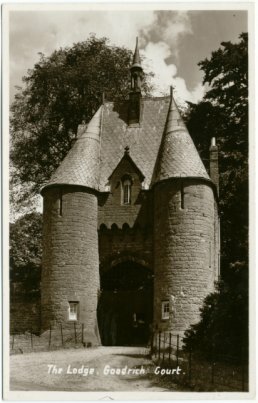 Indeed the gatehouse, which still looms over the A40 today, was apparently closely modelled on one in Aachen. The building was completed by 1831 and not everyone approved of this rival to Goodrich Castle. William Wordsworth famously described it as "an impertinent structure". One suspects that some of our local pressure groups of today would have had views to express too. From the first, the Court was meant to be part home and part museum. It was intended to form an attraction on the Wye Tour and Guidebooks were published and domestic servants trained to conduct visitors round the rooms. There was a Grand Armoury, 86 feet long, full of ancient British arms and armour. There was also an Asiatic Armoury with Islamic decor under a ceiling of gold stars on a blue ground, the Hastilude Chamber (Hastilude = literally 'spear play') fitted up to resemble a jousting match and a South Sea Room where 'rude weapons' from the Pacific Islands were displayed. Visitors also saw the Banquettmg Hall where, rather incongruously, the high table normally placed at the dais end was replaced by a billiard table. Some felt that the displays were too instructional and not sufficiently romantic in character. Armour was displayed on wooden figures, rather than being left empty, and signs with the unequivocal instruction "Don't touch anything" were put up everywhere. Meyrick also had rooms for his private use designed in a number of styles, medieval, renaissance, Queen Anne revival, etc. and those too were crowded with other objects from his antiquarian collections - including furniture, enamels, candlesticks, caskets, other ecclesiastical objects and paintings. He lived in neo-feudal splendour, and liked to invoke the pomp and circumstance that he imagined to have existed in the olden times. Wainwright quotes from a report from a visit by the British Archaeological Association. Sir Samuel "conducted the guests over the entire suite of apartments, pointing out and describing the more venerable and interesting objects in the extensive and valuable collection. The inspection which exhausted several hours, was diversified by a collation served in the banquetting hall, and the introduction during the repast of Welsh minstrels who, in the minstrel's gallery, played and sang old Welsh airs and songs; the history and peculiarities of which were explained by Sir Samuel successively." Meyrick died in 1848 when he was just on the point of clinching a deal to buy Flanesford Priory. The Court was left to a cousin who later sold the collection and then the building. The purchasers, the Moffat family, made a number of changes including, as we have seen, building the current walled garden. The house subsequently passed, as a result of marriage, into the Trafford family of Hill Court. After the Second World War, when Felsted School from Essex were evacuated to it, it went the way of many large and unwieldy country houses at that time and fell to the demolition men in 1950. Little remains apart from the gatehouse, the walled garden and adjacent stable block and Ye Hostellrie Inn in Goodrich village, rebuilt by Meyrick in a spiky gothic style. Some elements of Sir Samuel's collection can still be seen in public museums, including armour in the Wallace Collection in London. Of Goodrich Court itself, only the name remains, appropriated for a rather bland block of retirement flats in Ross. With all due respect to those that live there, this does seem a bit like naming the milkman's horse 'Desert Orchid' or Shergar'.